In 1933 Adolf Hitler, as leader of the National socialist party, was elected leader of Germany. The people, suffering from the depression, welcomed the change of power, which gave hope of a new, strong Germany. The new regime’s attitude towards those of different opinions became clear quite quickly. Even before the outbreak of the Second World War, the Nazis where accused of limiting freedom and rights of its citizens, and for interning political prisoners in ‘work camps’. 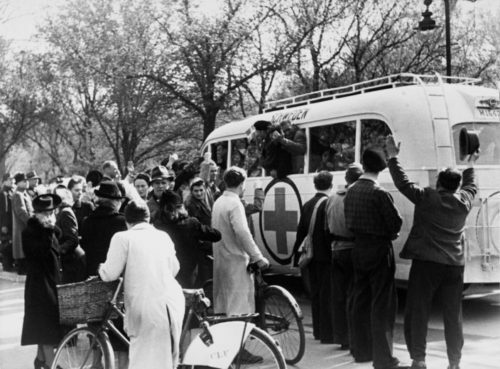 This lead to reactions and protests from Sweden – the Swedish Red Cross acted by means of pleading and démarcher through its president, Prince Carl. In April 1933 he wrote to the German president Hindenburg protesting against the Nazis limitations of the freedom and rights of the Jews. During autumn 1933 and winter 1934 prince Carl wrote several letters to the president of the German Red Cross and asked him to investigate the alleged cruelties of the Nazi regime towards persons suspected or imprisoned for their political opinions. The Swedish Red Cross offered to visit the camps as an independent party, and in this way help clear Germany from the accusations. The German Red Cross replied, on January 31 1934, that they themselves had access to the camps. The matter of the camps were, in their opinion, internal German business for which the national Red Cross society was responsible for. The request from the Swedish Red Cross was construed to be distrust of the German Red Cross activities. The German government opposed all international inspections of the concentration camps. The Swedish Red Cross also informed the International Red Cross Committee of the letter to the Germans. ICRC welcomed the Swedish initiative. They had also been in contact with the German Red Cross and urged them to attend to the political prisoners’ destinies from a humanitarian point of view.